Promethea | Full. Body. Transplant. One Comic To Rule Them All. If I have told you once, I have told you a thousand times. Promethea is the best comic book of all time. Since Jeromy Cox has recently posted some sweet double page yum yums on deviantart, it is time to say it again. Promethea is the best comic book of all time. If the oozing eye candy of those are still not enough to convince you, please study our Mick Gray connection for proof. And check out one more heaping helping of visual bliss before bed. No matter which direction you look at it, the truth remains the same. If I have said it once, I have said it a thousand times. 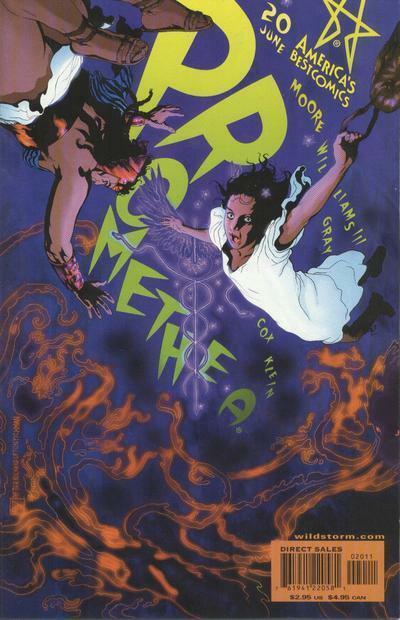 Promethea is the best comic book ever made. Alan Moore, JH Williams III, Mick Gray, Jeremy Cox, and Todd Klein created a transcendant testament that tickles while it teaches. There is, perhaps, no greater source for learning about magical and spiritual traditions while being totally entertained. If you have never read the 32 issue series, please do it as soon as you can. Our personal connection to Promethea is pretty intense. We jumped in at issue 12 and it became the only book we ever wrote letters for. Yes, the early issues had a published letter section just like the glory days. The book was highly irregular when it came to schedule, and I will never forget the months it was late. Such delicious agony. Then the ecstasy. The page above shows the moment that Sophie finally came face to face with God. Did she say just any old words? Of course not. She was Promethea. She was the invisible embrace of the collective imagination that joins us all. She said our prayer. We have three children. They are magical adults now, but every night when I tucked them in we said a prayer. It goes like this. Dear God, I love you. Help me to be what you want me to be, and thank you for everything. When I saw that Alan Moore had written the same words for Sophie to say when she finally got a chance to speak to The Universe, I was speechless. There were many, many moments like that from 1999-2004 while the new issues were still flowing. Issue #32 was the end of the line, in keeping with the Kabbalistic tradition. Promethea, however, lives on. Surfing the interwebs keeps everything going nowadays. Yesterday something jumped from its grave and pulled my eyes out of their sockets. I was toying with bing instead of the google, and their image search returned a synchronicitizer stronger than any other. 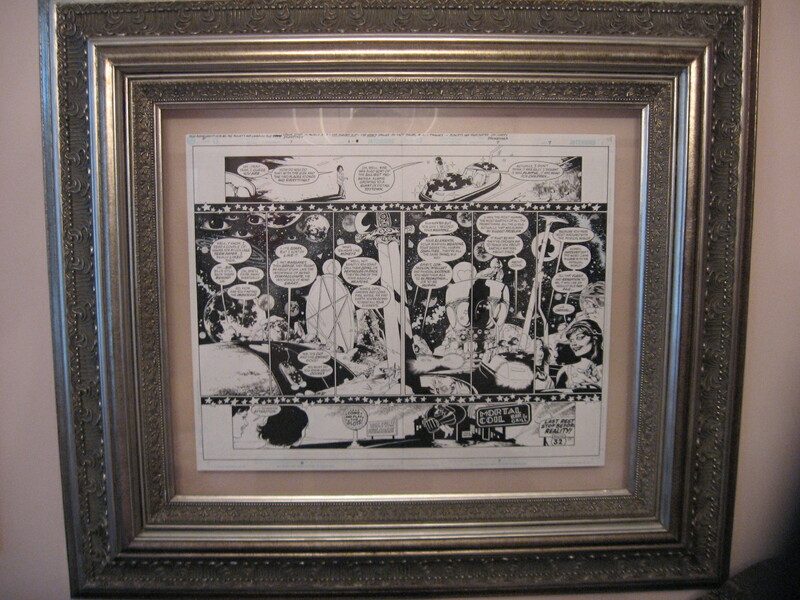 The best interview I ever found involving Promethea contained two pics that blew my mind, since the original art hangs on our wall. They were nestled comfortably alongside Mick Gray, the World’s Greatest Inker. We will start with the interview highlights, then I will explain the connection. Working on Promethea is much more challenging than any other job I have ever had. J.H. is always pushing me to the next level and it has been very rewarding. I am not looking forward to its end. It is just so inspiring to work on this book. 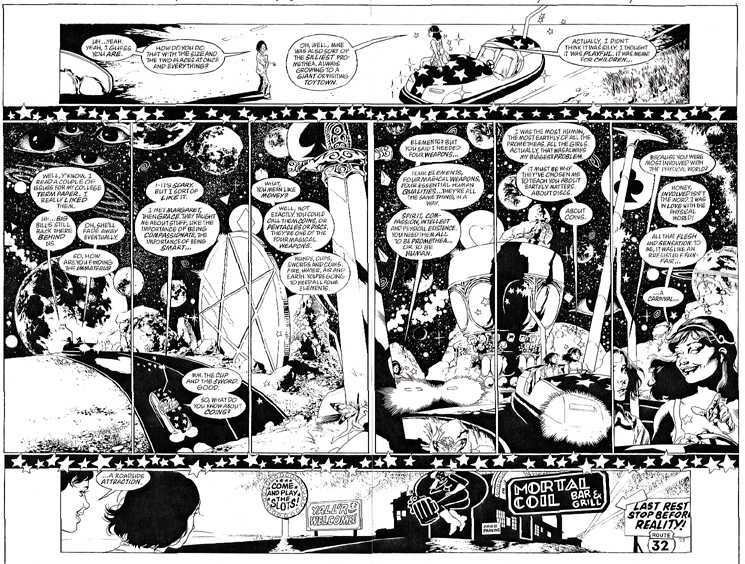 Alan Moore is well known for the notoriously long and detailed scripts that he provides for his illustrators that still give leeway for their input into the finished product. Do you get to read much of Alan’s scripts yourself or do you just concentrate on finishing the art that JH Williams provides for you? I have a copy of the script for issue #1 and it is huge. But my job is to work close with J.H. to try and capture the vision. 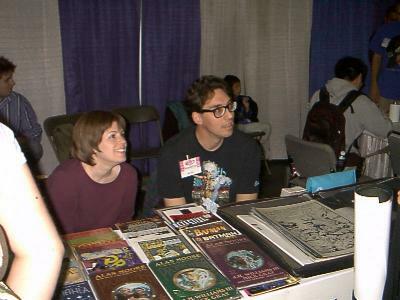 I have only talked to Alan once over the phone (After we won the Eisner award!) but J.H. talks with him quite often. There is a lot of communication between everybody who works on this book, this is why the quality is so high. When Promethea finishes with Issue #32 you will have been working on it for about 5 years (1999-2004). Is this the longest you have worked on a single title? Yes this is the longest run we both have on a book. 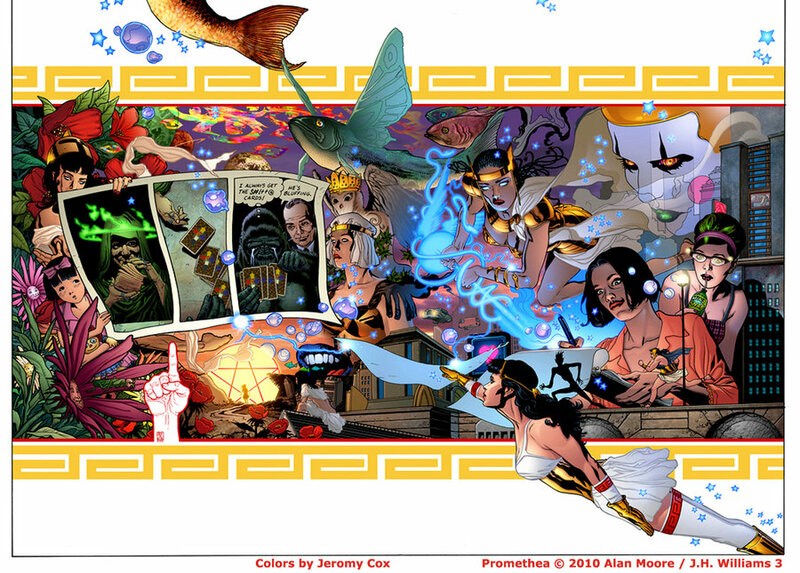 What are some of your favorite images from Promethea so far? The “Mobius Strip” page from issue #15 (this is most definitively the most asked about page), the “Four Horseman of the Apocalypse” from issue #5 and the whole issue #12! From an artists point of view what were some of the hardest images you have had to produce for Promethea. Which images do you think most closely approximated what you imagined they would turn out like? The “Four Horseman” page was a lot of work, it just took a lot of time! And issue #12 was pretty tough because of the deal with all the pages put end to end make one long piece of art. That took extra time in making sure all the pages butted up to each other just right. Wow, that was some issue. Do you have a favorite character that you enjoy producing an image of more than any of the others? I have a soft spot for the original costume of Sophie’s. I miss it! Even thought it took longer to pencil and ink, it was just so cool. Both Alan and JH Williams have said in interviews that while they were working on the Daath Issue “The Stars are But Thistles (#20) they were taken quite ill as if someone or something didn’t want them to be doing it. Did you have a similar experience yourself when you worked on it and have you received any interesting feedback from readers about this particular issue? 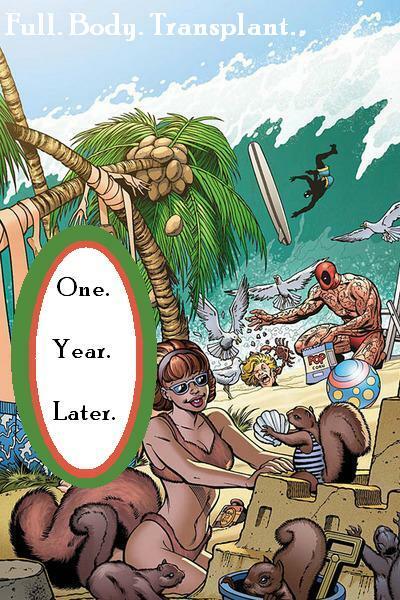 Hmmm… I had a really bad hemorrhoid during that issue… just kidding. I have never heard about this from Alan or J.H., sorry. Has working on Promethea spurred any interest in finding out more about Magick, The Kabbalah, Aleister Crowley, Austin Osman Spare, John Dee or any other figures of real people who have appeared in Promethea? I am very interested in the Kabbalah and I have been on a spiritual journey of my own for many years. Working on this book has just made me more interested in these subjects. Issue #26 which just came out looks and feels almost like a Tom Strong comic rather than the usual Promethea one (if there is such a thing as a usual Promethea Issue). Did you enjoy your change of style on this one. Are there any other comic such as Ghostworld which inspired this style? I just love all the different styles J.H. has used on Promethea. It just makes it so much fun when you don’t know what is coming next. How many awards have you won for your work on Promethea. Was the Eisner a single statue that you had to share with JHW or did you each get a statue? We have been nominated many times (including this year!) for different awards but the only one we have actually won is for “Best Single Issue” for Promethea # 10 in 2001. We each got a nice plaque for our walls! Is there a question about your work on Promethea that no one has ever asked you but you wish they would so you could answer it? If you could work on any book, with any team, and do it forever, what would it be? 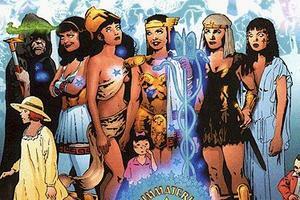 Promethea. Endless love to eroomnala for that magnificent interview. Now the freaky part. 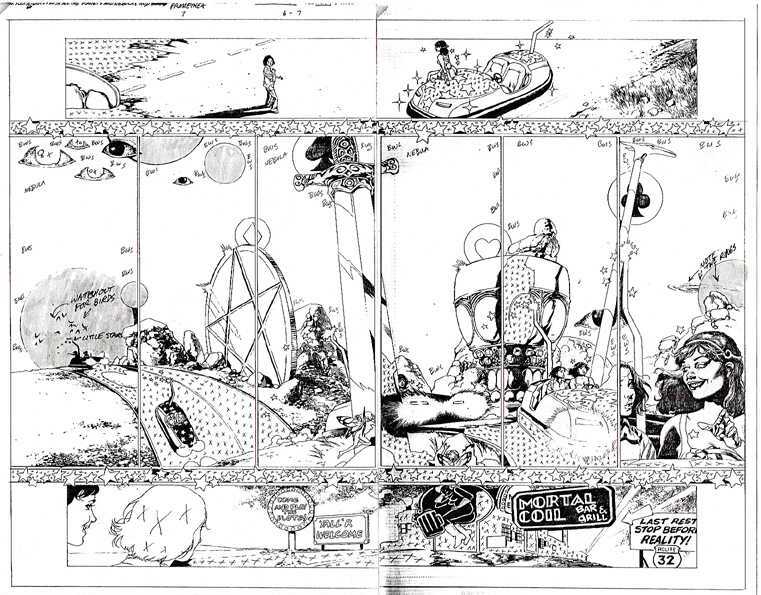 Mick Gray supplied a before-and-after set of drawings to illustrate the state of the page when it was given to him by JH Williams III. It just so happened to be the exact page we own, thanks to ebay. Spooky conicidence? Divine intervention? Either way, what bliss. That is the drawing from JH Williams III. 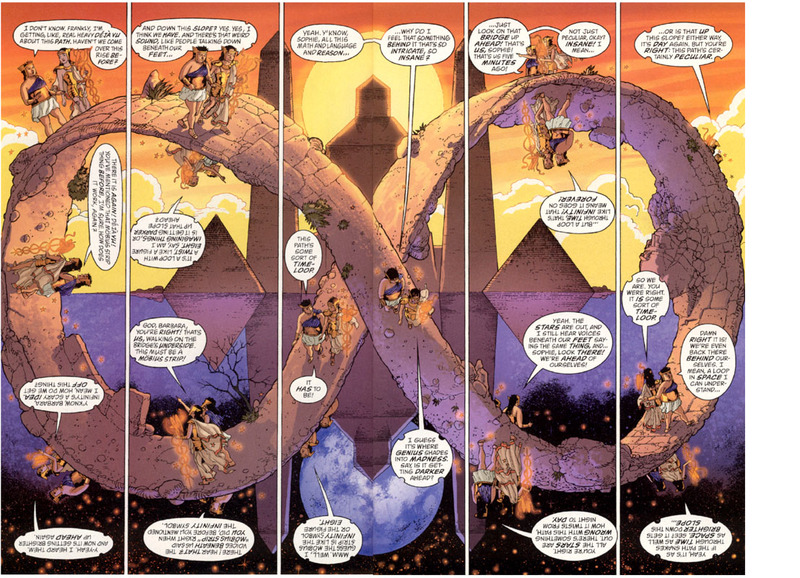 Promethea #7, pages 6-7. That is the finished inking by Mick Gray. The planets and eyes are actually collaged onto the ink surface. That is a photograph of the pages, hanging in our bedroom . So, you see, Promethea lives! Synchronicity is her standard time zone, and she set the alarm for this very moment. Thank you Alan Moore. Thank you JH Williams III. Thank you Mick Gray. Thank you Todd Klein. Thank you everyone at DC who allowed something this real to be published. We will glow in gratitude forever. Alphabets of Desire: The Words Get In The Way. 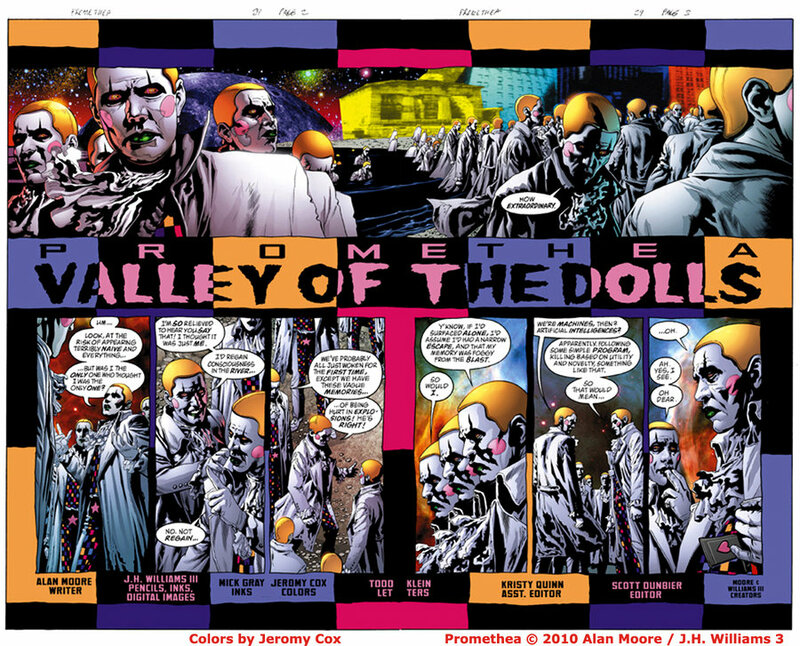 Welcome to the third portion of the extended study of Alphabets of Desire by Todd Klein and Alan Moore, who also happen to be two of Promethea’s real parents. Our introduction has the full image and ordering information, this section has a knife. We are living in a code. We feel the apple resting in our palm, its weight, the waxen texture of its skin. We see the highlights rolling on its dimpled contours and the point at which leaf-green becomes lustrous red. Lifting it to our lips we catch its perfume, redolent of rural mornings, urban dinnertimes, our mother’s pastry and the way she had her hair. Our bite is audible, the crunch of tooth enamel in the crisp wet flesh, cell splitting violently from cell and a sweet aerosol of juice sprayed from the fissure as microscopic dew upon our taste buds. The familiar flavor is infused in our saliva, its initial sharpness rounding to a sumptuous curve there in the mouth’s dark privacy and rivulets of juice uncurl in sticky ribbons on our chins, but our experience of the apple can be only an experience of those words used to contain the raw phenomenon: red, green, sweet, crisp, round, and the way she had her hair. Do you remember the last time something felt really good? Well, while you were actually experiencing it you weren’t putting it into words. Direct connections don’t have soundtracks. Or narration. Or storyboards. The human brain gets trained to explain. That sack of meat in the skull is ideally suited to specific translation and categorization. Once it is schooled, it is too late. The exquisite apple eating doesn’t happen to you. It just happens. In order for you to know what you went through, you need to use code. Identifying yourself with the bliss is a separation process. The words get in the way. Those are three of the original construction sketches from the Promethea cold-cast statue. I found it on the blog of J.H. Williams III, and the originals are for sale in his store if you have the cash for the ultimate holiday gift. The structure of the Promethea myth lends itself very directly to a set of Vs. System cards. It has enough dense source material that it could actually become an entire expansion set. It also opens the doors of perception for crazed creativity. Promethea is genuinely fantastic work of art. Moore did things with words and pictures that you simply could not do in any other medium. That’s why I love this community so much. You guys always stretch my limits and take me places that I might not have found without you. 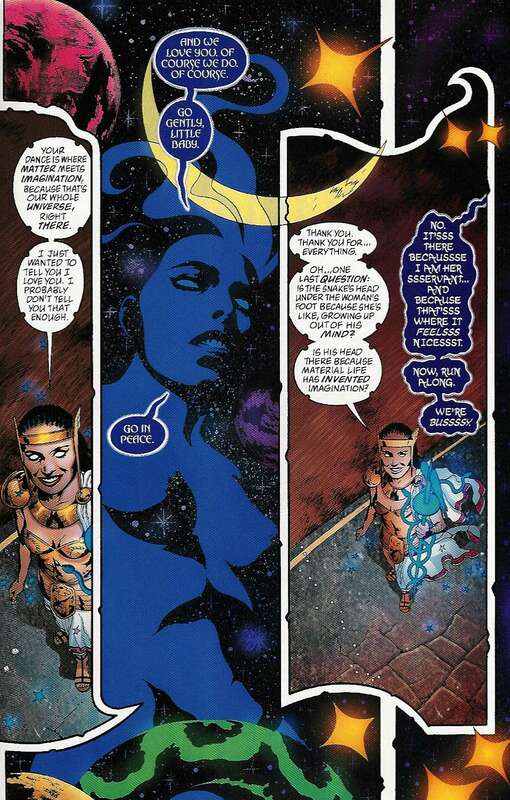 Alan Moore’s Promethea is the only comic book that I ever followed religiously from issue to issue running like a madman to the store each month a new issue came out and following each sequential panel with baited breath for six years straight until it was done. It has never been surpassed. It may be the greatest single human achievement ever when it comes to merging imagination with reality. While it was happening, from 1999-2005, Alan Moore talked about the experience quite candidly. Well… the more you look at the real world, the more you realise that it’s just as interconnected, in just as preposterous a manner, as the fictional one you’re creating. I have never gotten over it, because I want it to last forever. The rest of this entry will give you a massive extended dose of Alan Moore’s own thoughts about Promethea, including his admission that issue #12, seen above with the Scrabble tiles, is the cleverest thing he has ever done. Now, I give you this. That is the first Vs. System fantasy card of the rest of my life. Promethea will be reborn. The Watchmen Lost Their Squid. A man with the actual name “Orlando Parfitt” is reporting a bit of a spoiler for the Watchmen movie, although anyone who would not want to know has surely heard by now. The Huge, Annoying Tentacles that unite the world at the end of the Watchmen graphic novel? Toast. Personally, I am bummed. Mostly because of my affinity for drippy trippy squippy things. A comment on the Newsarama announcement of this development contained a sentiment that sums up my remorse. To be fair, the Squid Monster has a definite “Georgia O’Keefe” feel to it, if you know what I mean. I dunno how well that would be translated in the movie. Spaz Monkey may be correct about the difficulty of filming such a thing, and it would have been tough to get past an “R” rating if they did it right, but I sure would have enjoyed it. Alas, no O’Keefe squidstuff for us. Back to Orlando Parfitt’s interview, shall we? The big question: What have you got against the squid?! Zack Snyder: I had a bad calamari experience as a child! Look I’ve got nothing against the squid. When I sat down with the studio and talked about the film, we had to make a decision about what stuff we included and what stuff we wouldn’t. For me Watchmen is all about the characters, whereas if we included the squid, I would have to illustrate it in the story and cut out some of the character. So I wanted more character and less story. So we came up with something else – no-one knows yet what we’ve done but we hope it’s similar in philosophy to the ending of the graphic novel. I mean the end is all about taking a superhero all the way – you know it’s the bad guy who is the one who wants world peace. It’s a moral dilemma for all the characters involved. Dave Gibbons: The tone of the graphic novel – the message, the moral ambiguity – has still been left intact. Also it’s not a squid; it’s a fifth dimensional phalymapod! Fifth dimensional phalymapod, world uniting squid, whatever you want to call it, it is out. Oh well, at least we still have the squishy stuff in Hellboy. Finally, for anyone who is seriously bummed out about this inglorious removal of tentacles, just wait until you see how much they need to change when they adapt Alan Moore’s Promethea.